England is becoming a nation of increasingly confident cooks. All across the country, budding chefs are taking to the kitchen with new found inspiration and passion. But what’s brought on this change, and how long are we willing to spend in front of the stove each night? We undertook a survey at the end of 2014 to reveal the answers to these questions and the changing cooking habits of England. Do you take pictures of your food and post them online? How does England rate its cooking ability? Who does the majority of the cooking in your home? 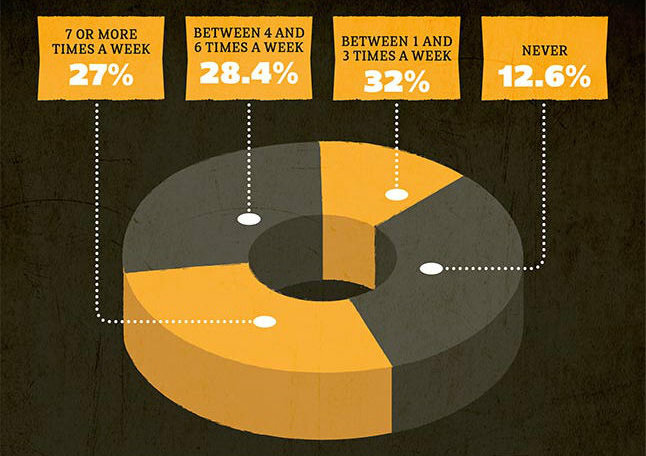 How much of your time is spent cooking each day? Do you agree with the move to make cooking lessons a compulsory part of the school curriculum? How many times a week do you sit down with family and/or friends and eat together? How many people are vegetarian or vegan in your household? More of us do not take photos of our food, than those that do, in fact, 55.6% do not. 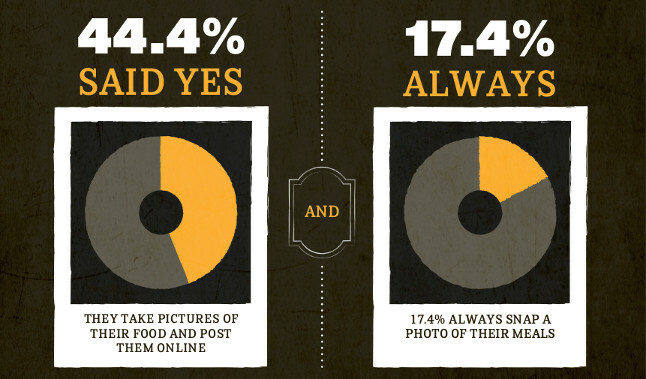 What is surprising is that 17.4% of us always take photos of our food! Putting that percentage into numbers, that’s 9,224,167 of us that always take photos of our food, according to the survey we ran. Does age play a role in this? 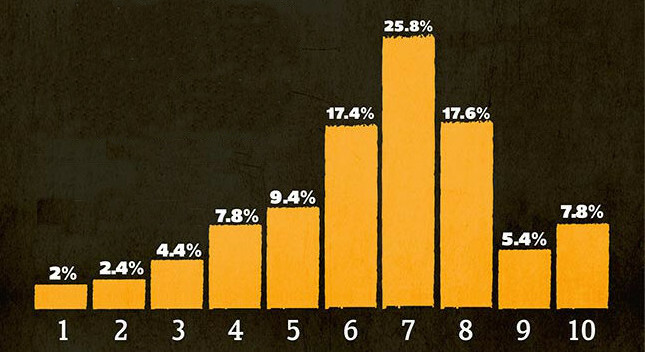 Age does play a large role in how likely you are to post photos of your food online. 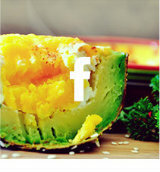 70% of people aged between 18-29 in the UK post pictures of their meals online. When we consider that 90% of the 150+ million users of Instagram are under the age of 35, this statistic is much easier to digest. 34.2% of us do not attribute our ability to cook to any particular source. They claim to have picked it up naturally over time. 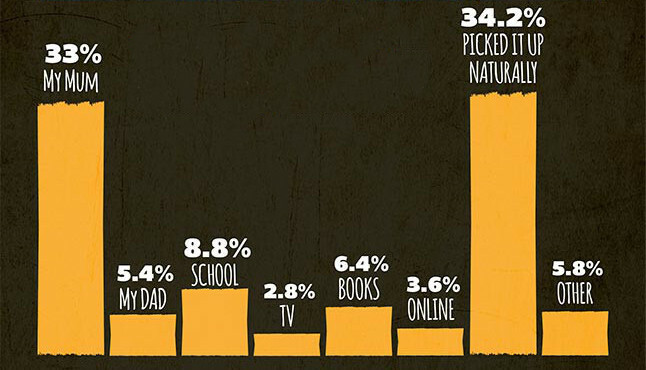 33% learnt how to cook from their mothers, while 5.3% learnt from their fathers. Households with a combined earning of more than £40,000 are more likely to have learnt to cook during their time at school, or from cookery books. Those aged between 40 – 49 are more likely to have learnt from their mother, or picked up their cookery skills naturally. People who live in the South of England are more likely to say they acquired their skills naturally. When asked to speak objectively and rate their cooking ability out of 10, the most common response from the people of England was a 7. Furthermore, 7.8% of those surveyed were confident enough to rate themselves as a 10, whilst only 2% would admit to being a 1. The majority (66.4%) of people claim that they do the most cooking in their home. 14.4% of young people said that their mum does the majority of the cooking for them and 7.4% of men passed the responsibility of cooking onto their wife. 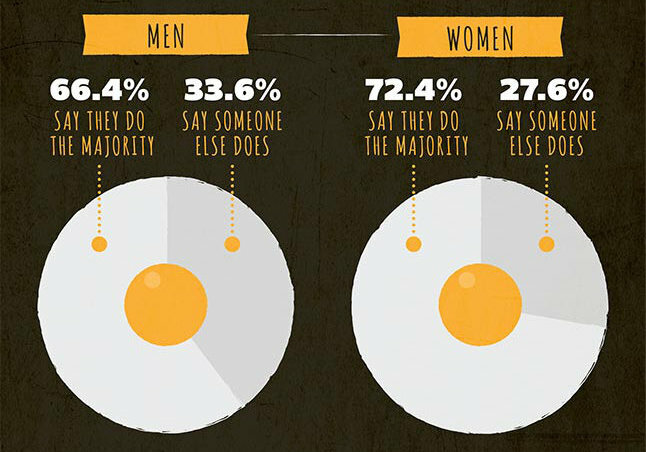 However, 60.4% of men said that they do the majority of the cooking, versus 72.4% of the women surveyed who said that they do the majority of the cooking. The majority of those surveyed (32.2%) said that they spend 30 minutes to one hour cooking every day. With 26.6% spending an extra half-hour creating their meal, and with just 8% spending over two hours cooking. And if you don’t feel like cooking, what’s usually the reason? Do you agree with the move by the government to make cooking lessons a compulsory part of the school curriculum? As of September 2013, cookery lessons became compulsory in the school curriculum for those in year 9 and below. Do you agree with this move? Of those surveyed, 69% agreed with the change. Women were more in favour of the change than men were. When it comes to eating together, 32% of Britons manage to do this between one and three times a week. However, 12.6% said they they never sit down to eat together. 79.2% of those surveyed have no vegetarians or vegans in their household, whilst 11% have just one vegetarian or vegan at home. However, 2.4% of families said that everyone in their home was either vegetarian or vegan. 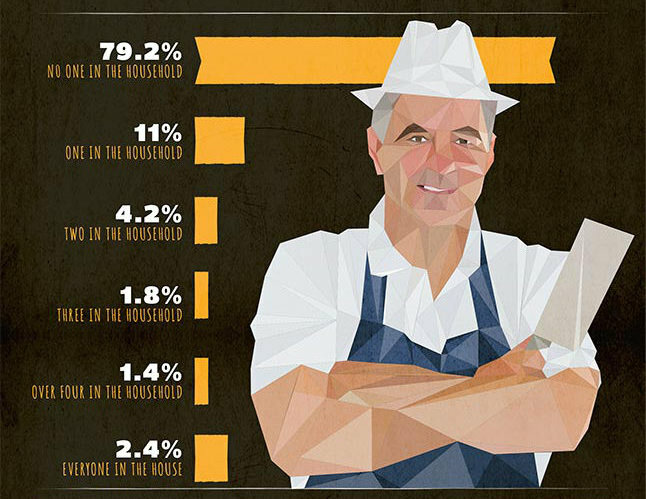 All figures and statistics were collected from a survey carried out by Wren Kitchens in 2014. All entries were from people who reside in England. I’d say learning to cook for me was a combination of my Mum’s teaching and picking it up naturally. I learned to cook from school and from my mum. I learned to cook from a variety of sources: my Mom, trial and error, looking at cookbooks, and activities at school and Scouts. I’m using the internet now to learn even more. I learnt to cook from my mum from the age of 13. She started off with chilli. I learned how to cook the basics and classic dishes from my Mum, although I have taught myself more exotic cuisine in recent year, using cookbooks and internet recipes. I learned to cook at school, then by trial and error over the years but I don’t class myself as a very good cook. Learnt some from school, very badly and most of it on my own with a lot of phone calls to my mum for advice. i learnt to cook at school, i started at 11 years old, but i’m still learning at 66!! I learned to cook in Home Economics lessons at secondary school although I did help my mom sometimes in the kitchen when I was a child. I was taught to cook by my Mum. If she’d never have taught me, I’d be useless as what we learnt at school was pathetic and not even worth the effort. I was taught the basics by my Mum but shes not the best cook to be honest! I really learnt to cook properly by a friend who inspired me with her Persian cuisine! when I was under 10 I used to go and sit with the lady next door who had been in service as a young girl …she taught me how to cook many things including seed cakes made with BUTTER something not common in the early 50s…Oh how I loved those afternoons and scrapping out the bowl and licking the spoon. Just trial and error! I didn’t have a choice once I got married or we would have gone hungry! lol. I didn’t really learn from my mum when I lived at home because she is the type of cook who throws everything in creatively and it always comes out wonderful. I’m the opposite. I can’t cook without following a recipe to the letter! I learnt to cook when I was at University, Living on my own for the first time came fairly hard and I had lots of disasters to start with but a lot better now!!! I learned to cook by watching my mother and I also had home economics lessons at school, so I also learned to cook there too. My mum was a really good cook so just by watching her I found when I got married that cooking came easily to me. Mum taught me to cook. I did the occasional baking with my granny, but mostly I learned by finding out what I needed to know as I went along! Now I pick up inspiration from allsorts of places, then look up what I need to know on the internet before deciding how to go about it based on my tastes and requirements! I learnt from my mum, at school and doing it for myself. i just wing it and see what happens. If its half way edible, i consider it a result! i baked with mum when i was a kid and learnt that side of things then, i was always a pretty fussy eater though until i spent the summer abroad when i was 18- my friends mum showed me all of her recipes, and it gave me a lot more confidence and widened my palette…..now i eat pretty much anything and love experimenting. My mum taught me how to cook! I learned quite a lot from my parents but also from cookbooks and trial/error. My Mum taught me a lot; the rest I learnt myself. My mum taught me a little and I learnt a little more at senior school but most came from trial and error when I got my first home. I learned to cook from my Mum. I learnt to cook with my mum who always involved us all in preparing meals and is a great cook – lovely nosh is the best incentive. I taught myself, from recipe books and, later, websites. Mum, *whisper it* isn’t a good cook but does admit she has no interest in it so who knows where my interest comes from. A little bit at school and the rest I’m picking up as I go along. I learned to cook from loads of different ways and people including my mum, dad, brothers, schools classes and personal experience. I learnt from my Mum how to cook the best Sunday Roast. She said it was something that would come in handy, and she wasn’t wrong! I learnt to cook by been abandoned in the kitchen! I learned to cook from my mum. I was home schooled and we had cookery lessons several times per week. I got some of it from my mum, and more from youtube/online. Also, as i’m always learning, the latter will take a greater proportion of the credit as time goes on. I learnt some from my mum and some if it is just trial and error and trying differant recipes. My husband taught me to cook, well he is still teaching me! I still have a lot to learn! Partly my mum but mostly just by going for it and no it hasnt always worked but thats half the fun! I also dont think you ever really stop learning when it comes to cooking…. i just had to learn when i moved out from mum and dads. salads at first !! My mum and grandma taught me the basics, school taught me a little more, and the rest has bee self taught through trial and error. I basically followed recipe books and made it up as I went along. If I had any problems I’d phone my mum! I am still learning. My mum taught me quite a bit but I seemed to have forgotten most of it so having to relearn everything. My mum was the WORST cook. Her speciality was burning – BOILED POTATOES. She’d literally over-boil them for so long that all the water evaporated and they burned to the bottom of the pot in a black mess. This meant I had to teach myself to cook if I wanted to eat something worth eating. When I moved away to Uni at 17 I had to full time fend for myself. While most of the other students in the communal kitchen were microwaving ready meals, or oven chips/pizza in the oven, I was knocking together spag bol from scratch or conjuring up a full roast dinner. My dad and grandmother taught me to cook and it was everything from scratch. My mum taught me to make scrambled eggs when I was little. I’ve never stopped cooking since. I am self taught and it has been an interesting journey. I originally followed recipes to the word but now I have the confidence to experiment with my cooking. I learned to cook by watching my mum. I learnt the basics from my Mum and then when I left home followed recipes I found online & magazines. I learned to cook through watching a lot of cookery shows and trial and error, slowly but surely gaining confidence. I learned to cook (kind of!) from watching my mum but I’m not inventive or creative at all – I have 5 or 6 recipes I can do by rote & anything else needs a very clear recipe! I learnt a little from my mum, some from books, and the rest I just picked up as I went along. A little from my mum but mostly just tried on my own. I learnt some from my mum, but our kitchen was tiny so that was ltd, a bit from school but lessons were short so it tended to be things like fairy cakes and a bit from TV. I think because my Mum and grandmas cooked from scratch it was a question of attitude, kind of “obviously you’ll be cooking diner” and that gave me the confidence to try, and keep on trying, until I mastered it. I learned from friends, magazine recipes and trial and error by experimenting. Hi Jamie, this is probably one of the most entertaining responses we’ve had, haha. Burning boiled potatoes… Brilliant. Maybe they should teach people in schools how to cook Sunday roasts? Yummy. We’d be a nation full of children cooking our Sunday dinners. Always funnier when it’s true! Haha. I can see you were the designated family cook then! They just get that luxury at Christmas now. I learnt to cook by mum and trying stuff myself. I learnt to cook from my mum mostly, although my dad taught me how to make bread and at school we did a hotpot and sandwiches – i still remember those lessons! I learned to cook partly from my mum and partly by using cookbooks and food magazines myself. I have spent a small fortune on cooking magazines learning to cook as no one else in my family have the skills! My mum taught me to cook and bake. I loved her food and I hope mine tastes as good! I learned to cook at School – We had compulsory Home Economics classes circa 1982! I learned to cook by experimenting with recipes. I taught myself to cook I watched a lot of cookery shows in my teenage years and experimented a lot with herbs and spices. By trial and error – mainly by following other peoples recipe ideas and trying to recreate them myself. I learned to cook from my mother because our cookery lessons at school were woefully lacking and all we every learned to make was a cheese and mashed potato mess! My mam learned me how to cook everyday meals, the rest I learnt by trial and error! I learned to cook from books as my mum thought pot noodle was a good tea. Nowadays I use the internet but I think I’m a good cook – trial and error and all that. I learnt to cook from watching my Mum and step-mum, but things really took off when I went to uni. My wife taught me before she came along the best i could do was pasta bake! Both my brother and I spent time in the kitchen cooking ‘treats’ with mom when we were young, however I really started learning to cook meals when I became vegetarian aged 12. I had a few recipe books, but I mainly learned through experimentation. I used to use recipe books, now I like to watch cooking programmes and have the confidence to experiment a bit. My Mum taught me how not to cook really, so she was pleased when I was old enough to lend a hand. Domestic Science lessons at boarding school. Made all the different types of pastry from scratch etc. My ex boyfriend showed me the basics and the rest I picked up as I went along. My mum taught me some and the rest I picked up on my own. My other half n kids will prob tell you I’m still learning!! haha. I learned by just having a go – my mum was not much of a cooker but I did used to help her bake at Christmas! I learnt to cook out of necessity but then realised I enjoyed it! I was self taught. I moved out of my mums when I was 19 and pretty much had to figure it out. I don’t think I do too badly at it these days. My grandmother was a cook in service, and I learned her recipes as I learned her stories, and for me they are still remembered entwined. I did C&G 706/1 at catering college because I always loved food and cooking, and still watch all the programmes on TV around food, cooking and eating (although these days I also watch programmes on dieting too, probably because of all the others!!!! 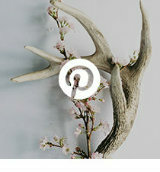 ), and look at recipes, and invent and experiment pretty much daily! My mum was ill & my day worked away from home, so both my brother & myself taught ourselves to cook & run the house when we were about 11-12. Can’t live on crisps & sandwich spread! How learnt to cook roast dinners & very basic meals from my Mum & I used cookbooks to make more complicated meals. From there I taught myself with trial & error. I learned to cook by trial and error! Some of my early efforts were hilarious! Helped my mum when I was growing up and learnt from her. My mother in law taught me how to cook…I love to cook and almost always cook from scratch. I learned at school. My mother is a great cook but never had the time to teach us. I am still very basic! I learned to cook at school, my mum taught me, recipe books.